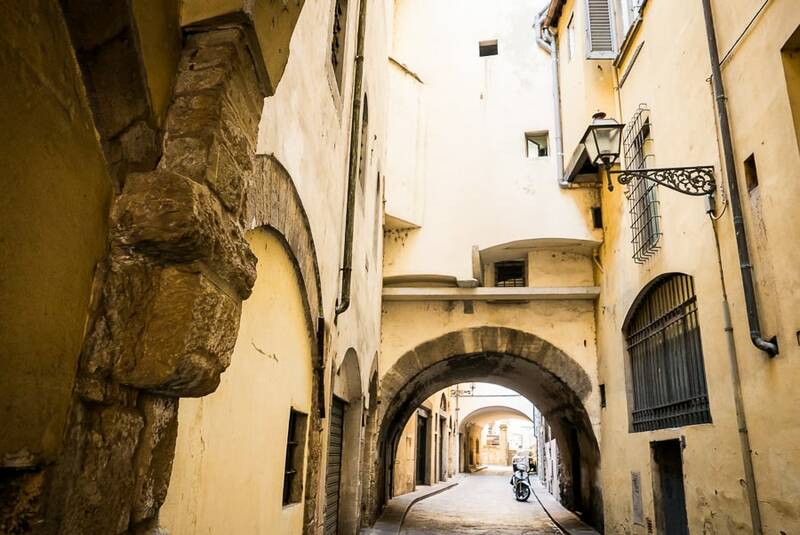 Florence is truly and absolutely one of the most romantic cities! 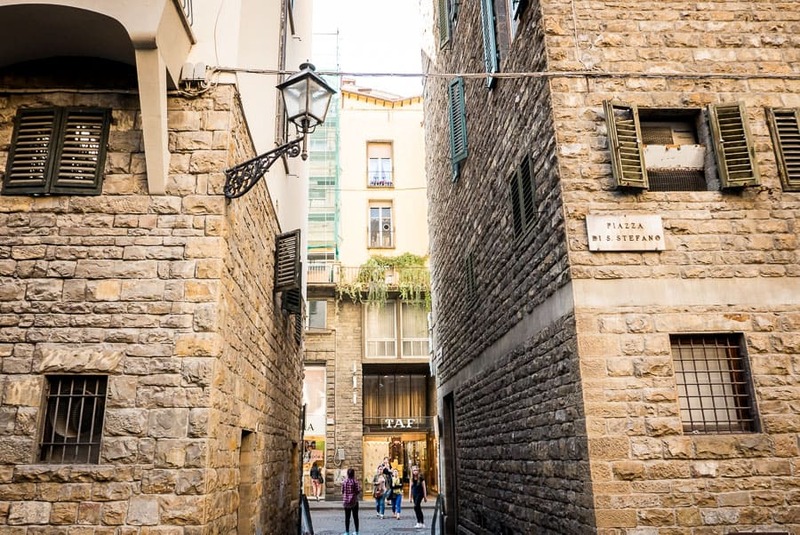 With its magical atmosphere, it is a city full of art and history. 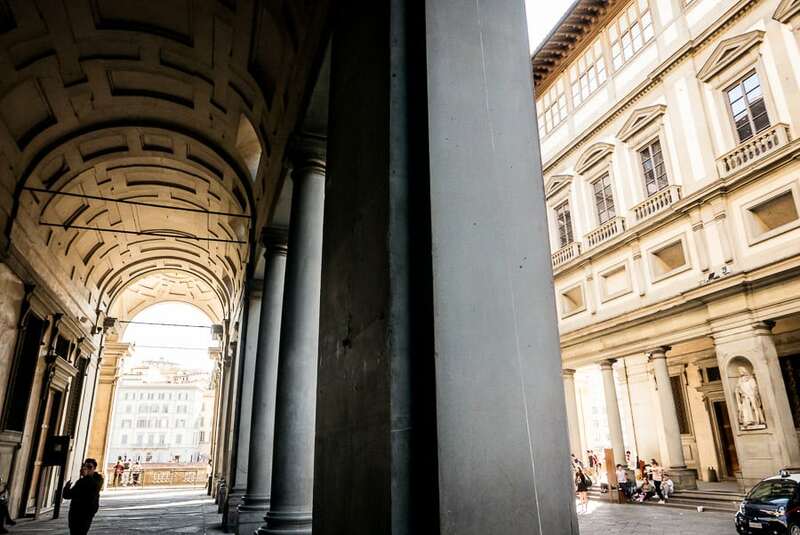 It’s the heart of the Renaissance and walking through it you can admire masterpieces of art and history everywhere. Obviously it’s also a perfect place to get married and where to take amazing wedding photography. 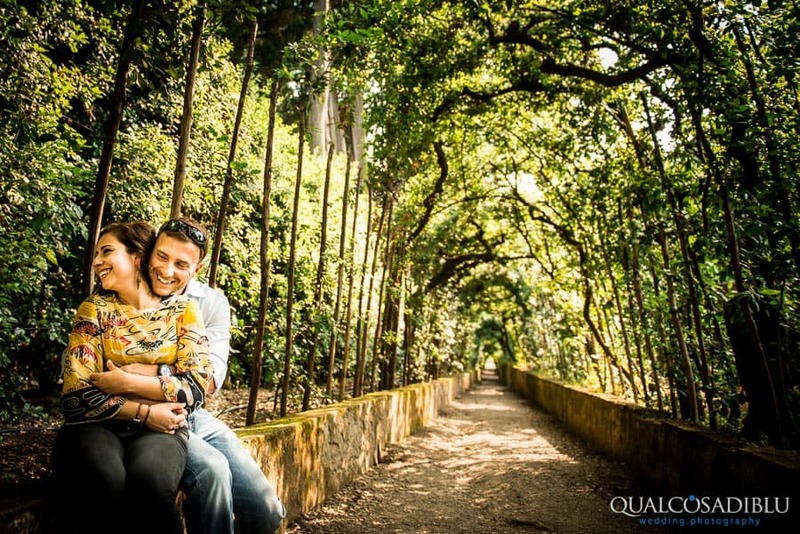 Are you a couple that is planning to get married in Florence and is wondering which are the best characteristic places where to make some wedding photos? 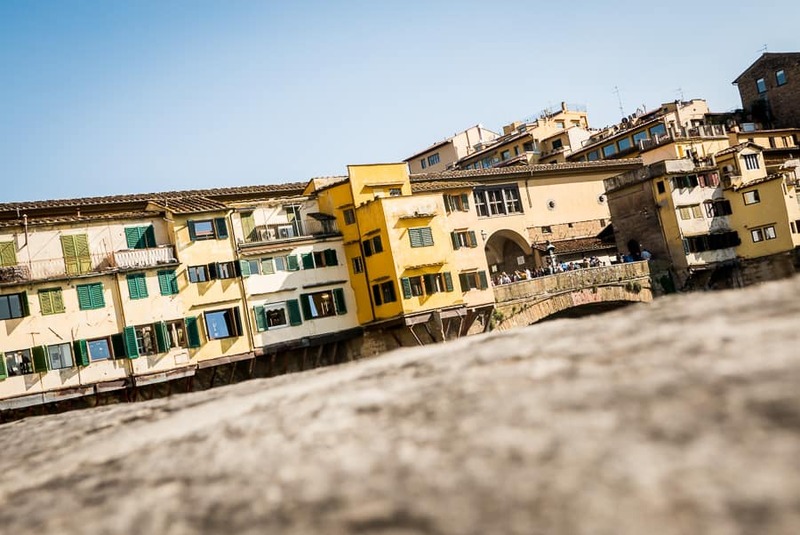 Are you a destination wedding photographer that is going to make a wedding photoshoot in Florence and is looking for inspiration about some good places where to take great photos in Florence? This post is also for you! 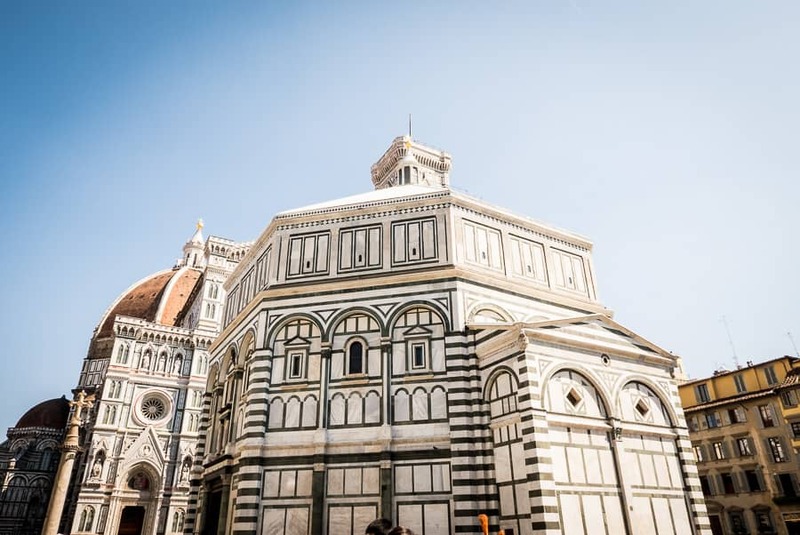 So I show you which are the best spots to take beautiful wedding photos (and not only) with bride and groom – but not only them – in the centre of Florence. 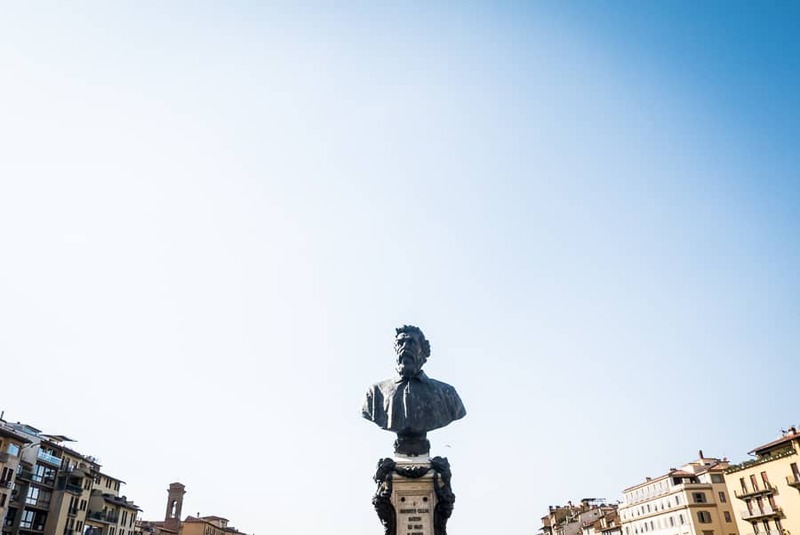 I went on a tour of Florence taking some nice pictures of most of these spost. 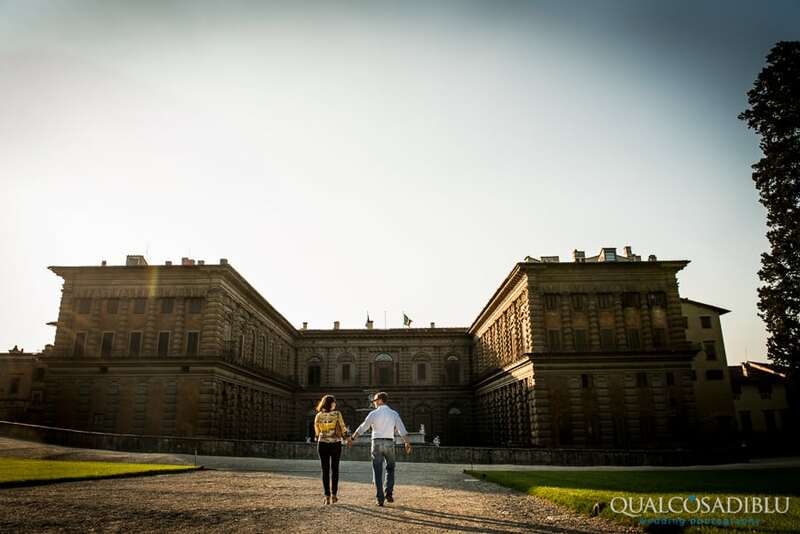 If you want to see some pictures with a real couple, check out engagement shooting in Florence. 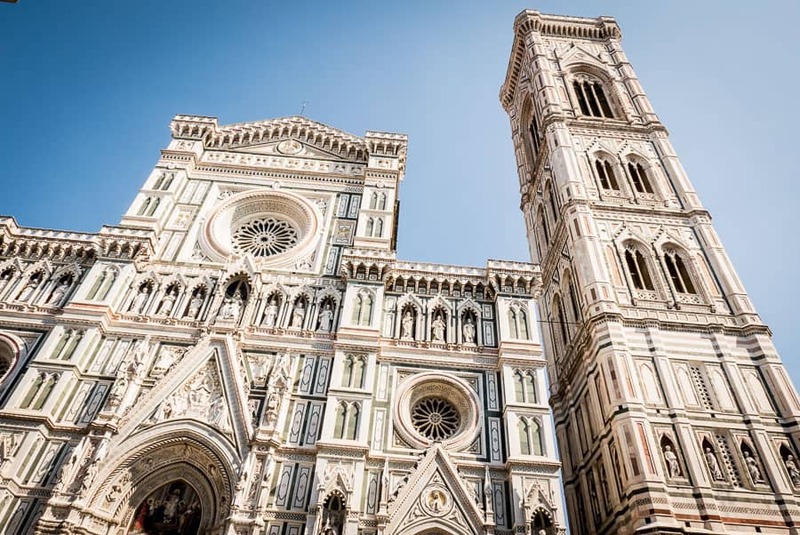 The Santa Maria del Fiore Cathedral is the main church of Florence and this place, together with the Giotto’s Bell Tower and the Baptistery, is one of the most representative of Florence. 1. 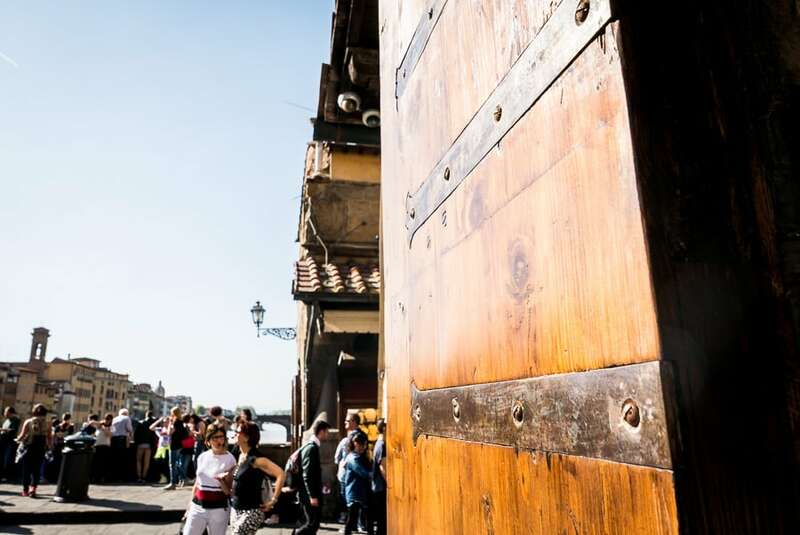 The old big green door of the Cathedral is a perfect backdrop for a photo. 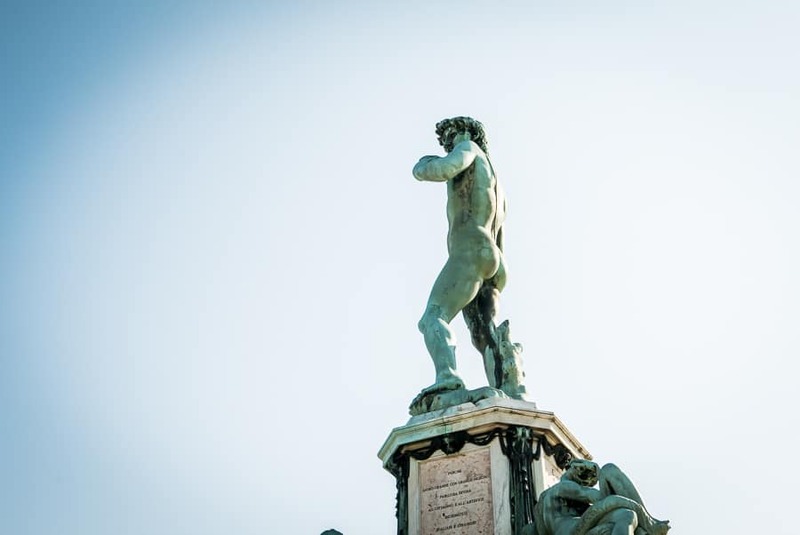 Piazzale Michelangelo is the perfect spot to get the best view of Florence! There’s a terrace that is perfect to catch the best sight. The bride and groom will be really happy to be there and be photographed in this beautiful location! Highly reccommend if you want a backdrop breathless for your photos! 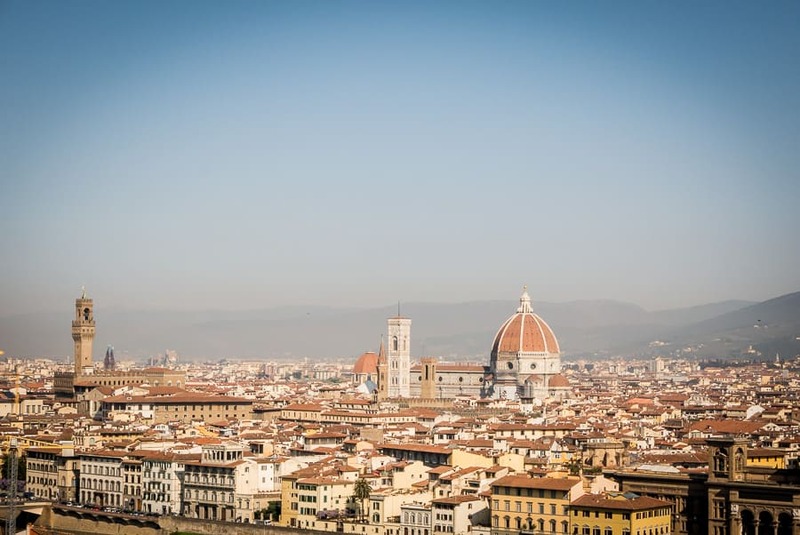 Would you like a beautiful panorama of Florence? 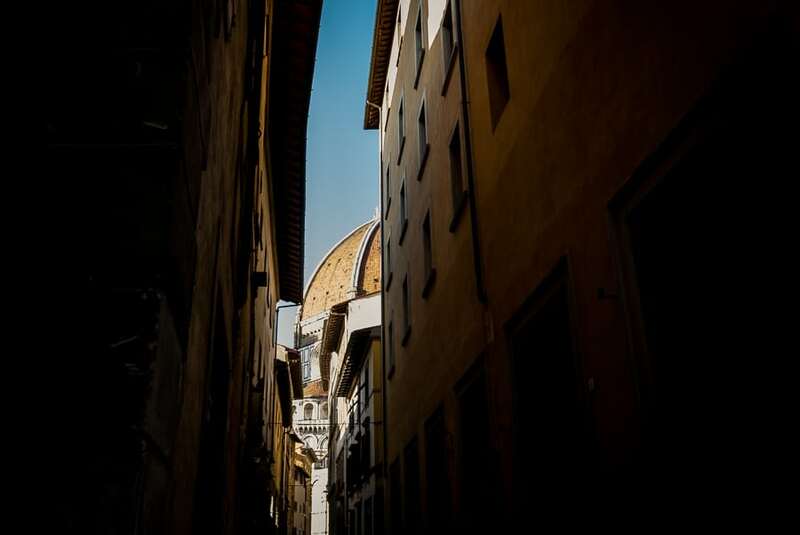 Would you take a wedding photo with the bride and groom with the sight of Florence as backdrop? This is the right place! You MUST be here! Little Tip: if you can, try to arrive at the last hour before the sunset because the light in this location is really amazing! If you decide to make a love shoot or just want an inspirational shoot this is the place for you! 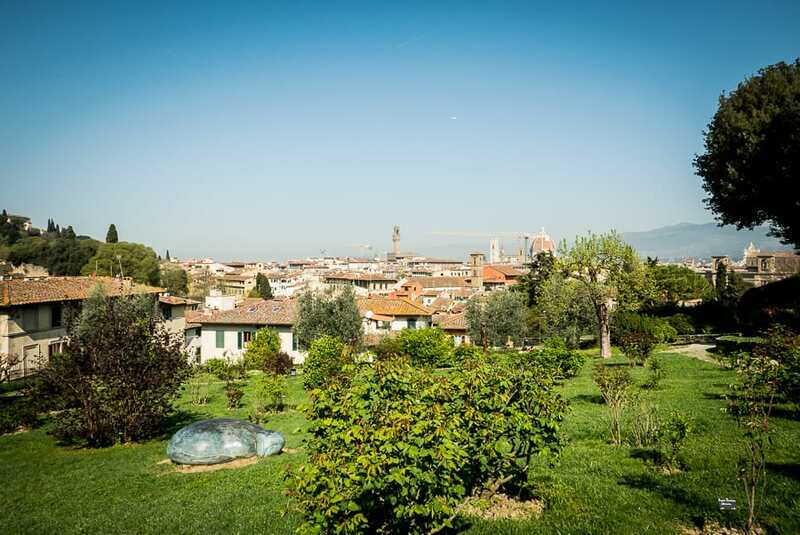 The Rose Garden is usually opened and is located next to the Piazzale Michelangelo; it also has a curious Japanese section inside. 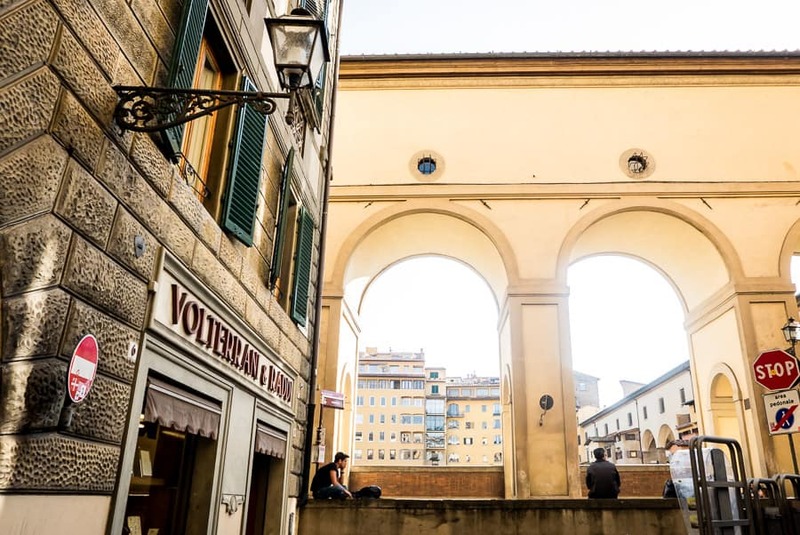 From this spot, you can also admire a beautiful view of Florence and you can find many spots to take photos with the bride and groom. 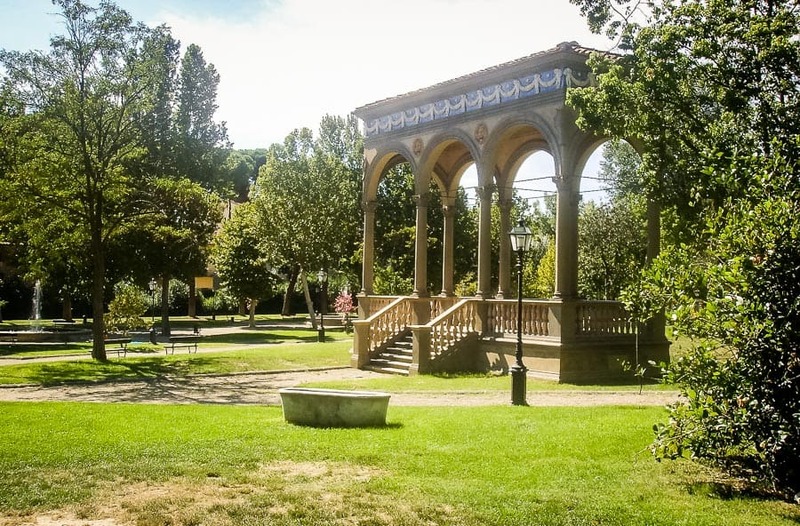 This is a real nice spot because it is fully immersed in the greenery with romantic places to sit in a relaxed atmosphere. You could easily stay here for more than 2 hours, looking for corners and places for shoot in this garden! Don’t miss the frame at the top of the Garden with a luggage shape, it’s a sculptur by Jean-Michel Folon. 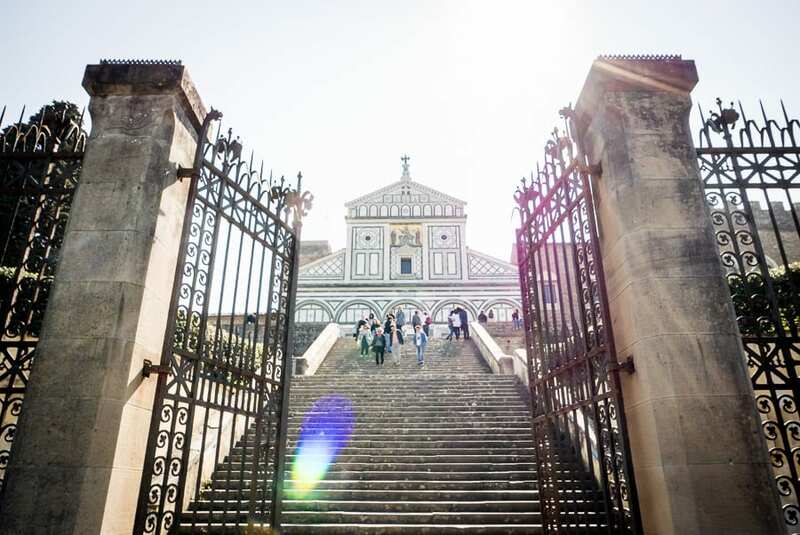 You can reach this wonderful church, San Miniato al Monte in five minutes on foot. It is located at the top of the hill, next to Florence. 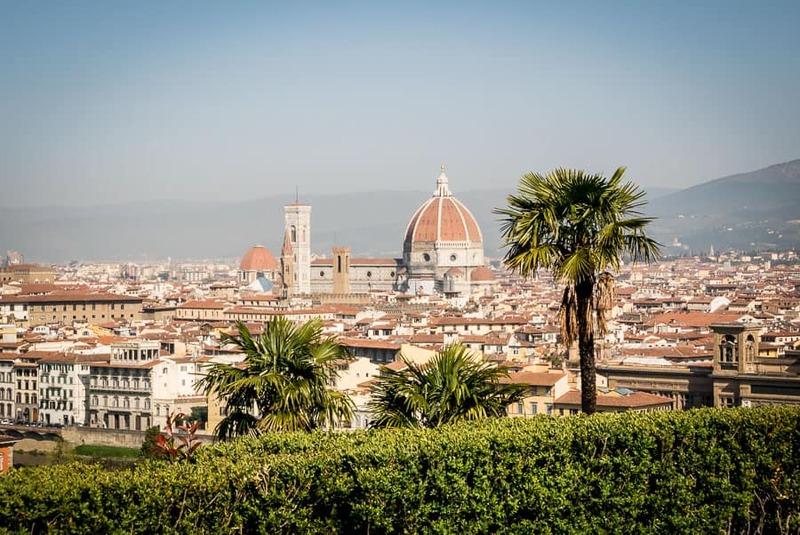 Similar to Piazzale Michelangelo, the view from this part of the hill is awesome and for sure this is one of the places that you’ll never forget. 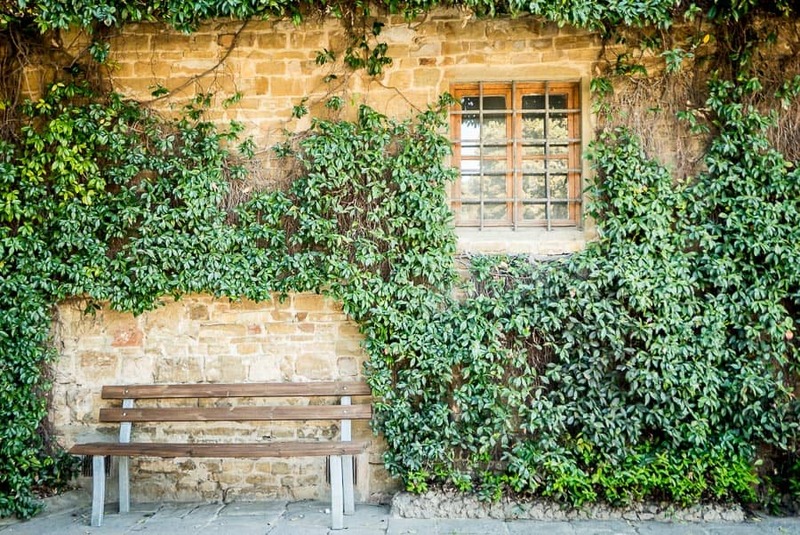 There is a small wall in front of the church and a nice tree, it’s a spectacular spot, just let sit down the bride and the groom under the tree and take the photo with the amazing sight of Florence as backgdrop! Don’t forget! Before arriving to the church you can stay and make some photos at the staircase, a nice spot! Look here for some pictures! 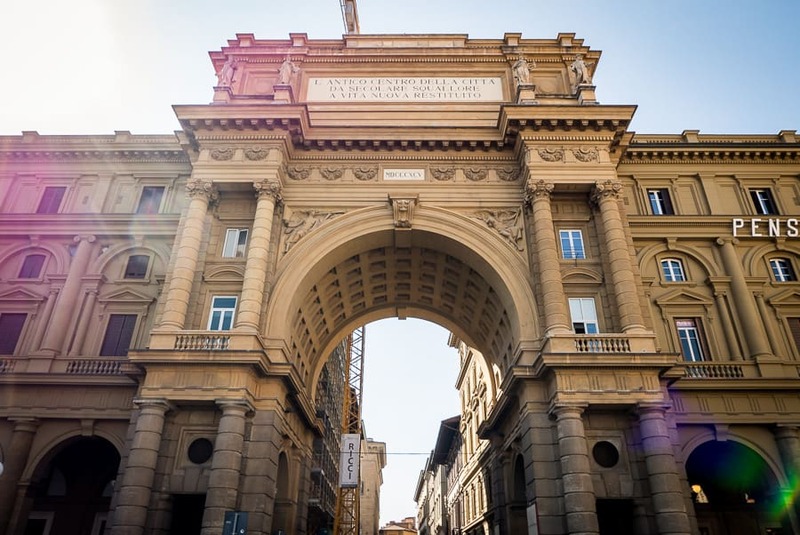 Piazza della Repubblica is one of the biggest and liveliest squares in the city center. There is so a lot of space and here you can let the couple walks hand in the hand capturing them from behind people, vendor carts or street artist musicians. 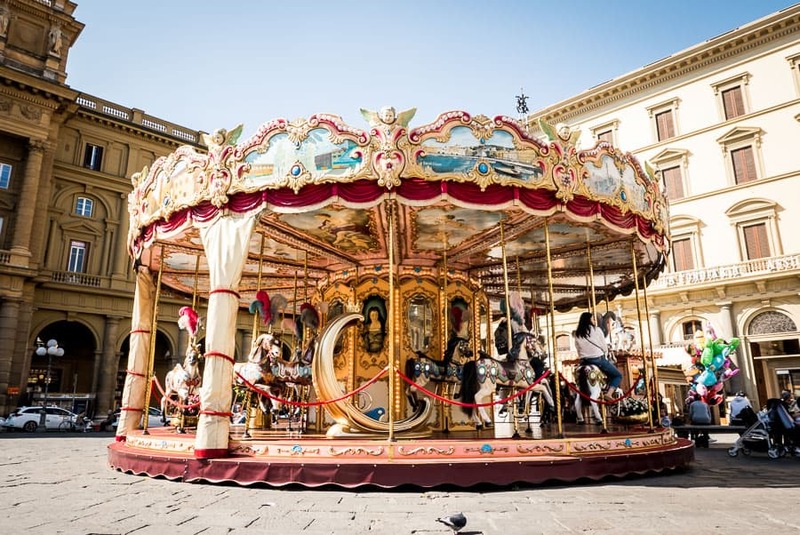 In this place there is also an old Carousel working and I usually use it to take some good and creative wedding photos. I think this is a good spot because you can get a lot of inspiration for your wedding photos. Let’s try to use our imaginations to get some original pictures! 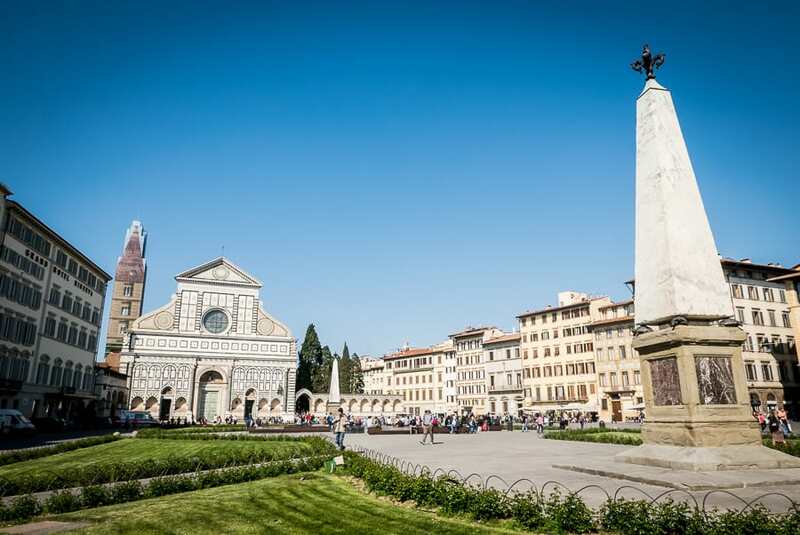 A square full of history, this place is one of the most well-known and famous in Florence. 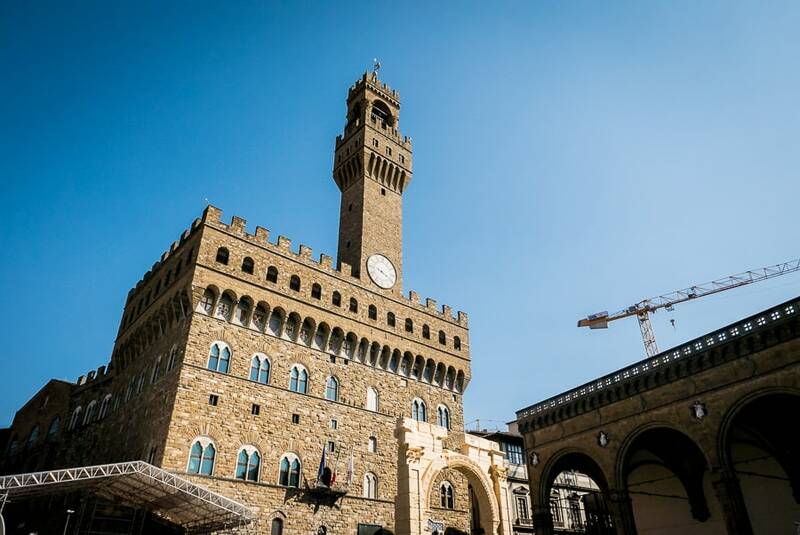 In Piazza della Signoria you can find Palazzo Vecchio (the Town Hall of Florence where weddings are celebrated), Loggia dei Lanzi and other historic buildings. 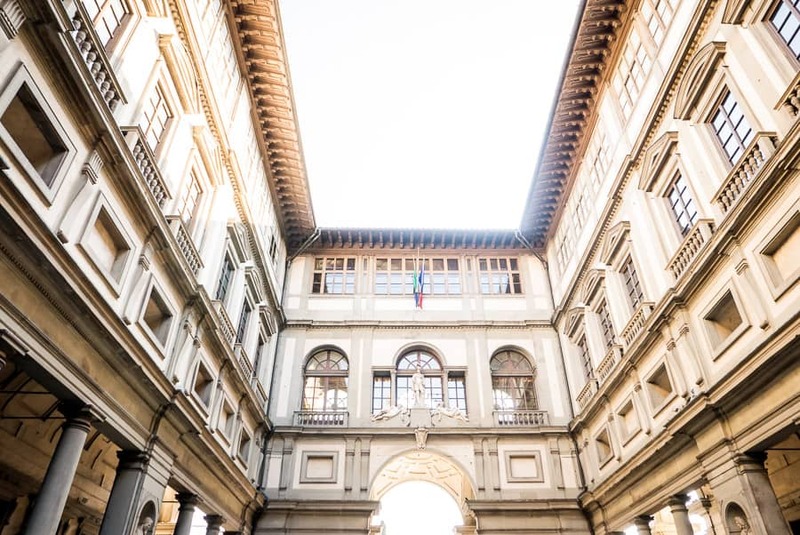 When you walk into this square, which is basically an open air museum, you feel surrounded by all the art, culture and history that Florence has to offer in one breath. 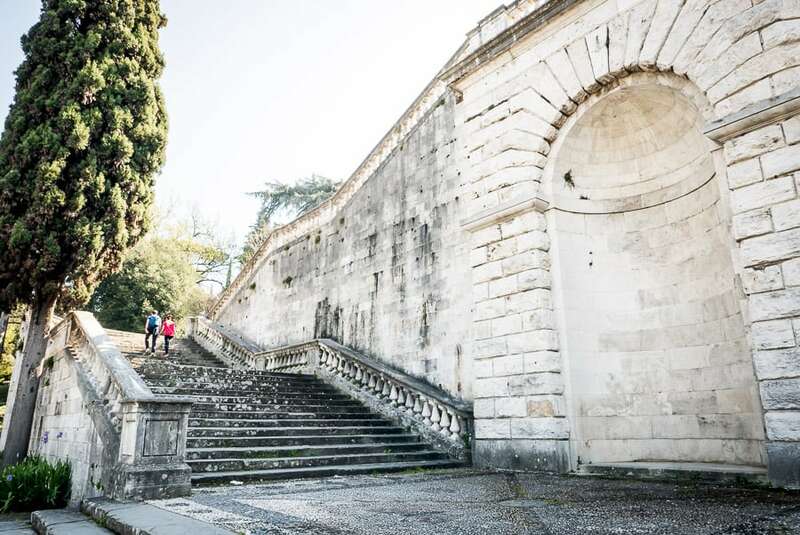 For this reason it’s one of the most impressive locations where you could take wedding photos. 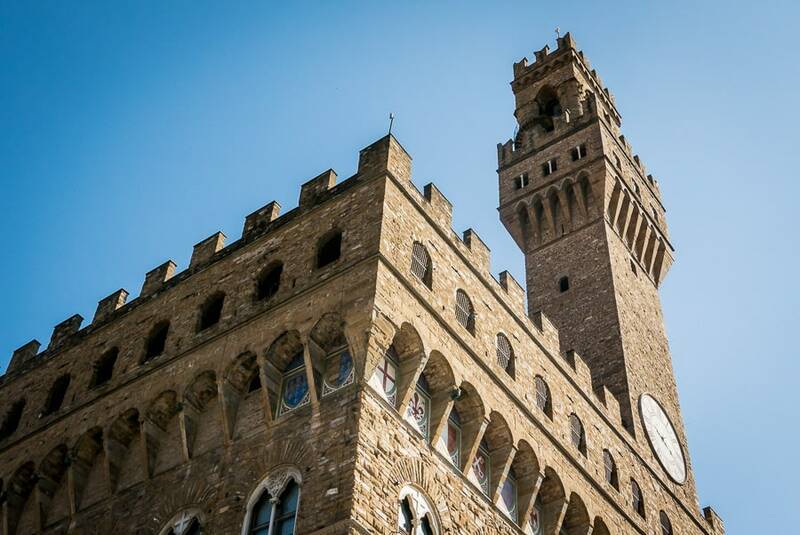 You can go into the main loggiato of Palazzo Vecchio, on the ground floor. It’s free and you’ll be able to take amazing pictures! Also here there are a lot of people and many tourists so it’s not easy to get good wedding photography, but try to use your creativity to your advantage! 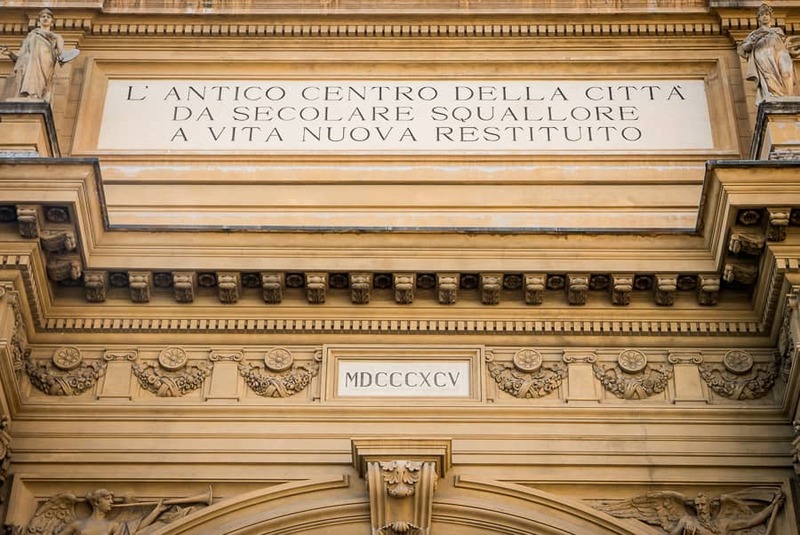 One of the most famous museums in Florence, in Italy and in the world. 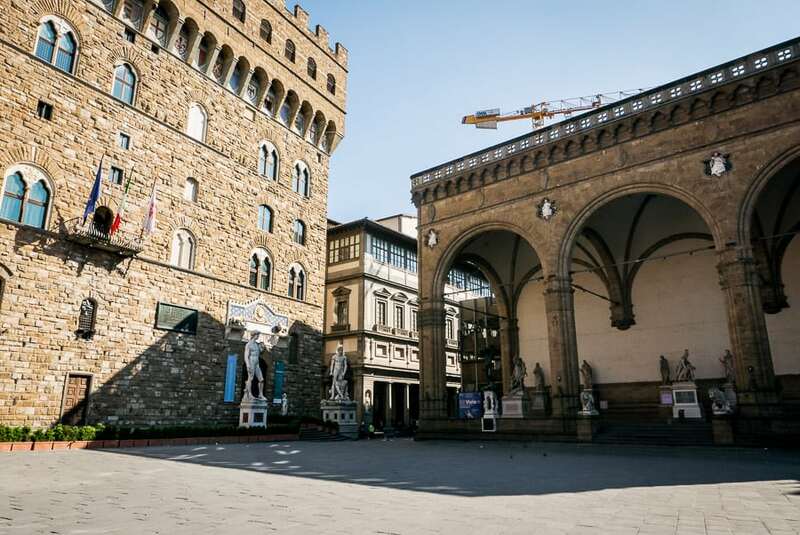 On display are masterpieces of the Italian Renaissance. 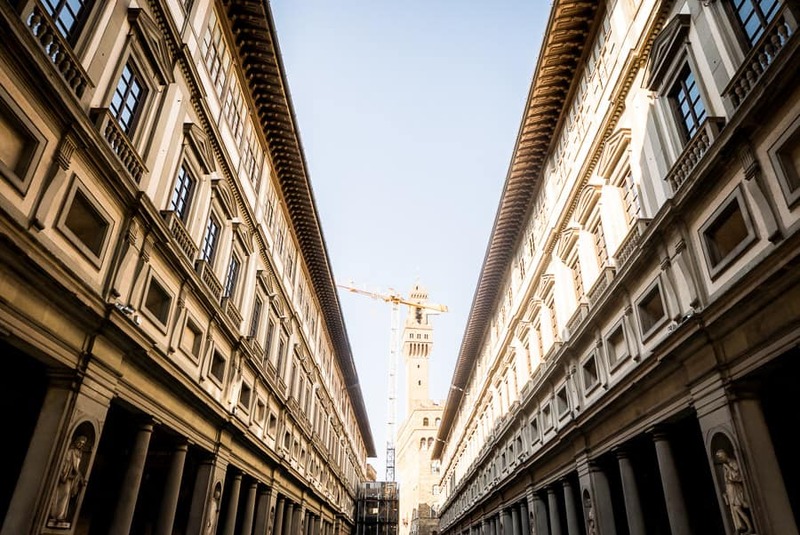 Uffizi Gallery is an important place and you should go here if you want to have an impressive wedding shooting. 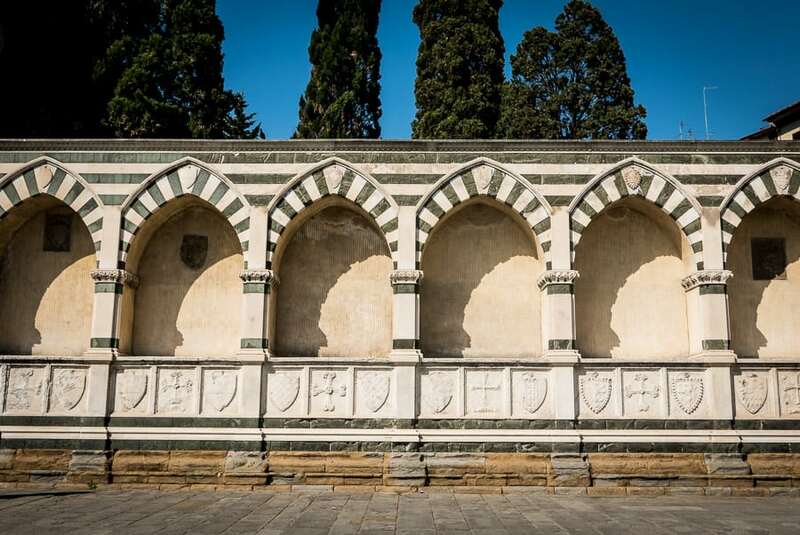 You could stand in the middle and take photos with the sculptures of Dante or Machiavelli or maybe you can stay under the loggiato, playing with lights and shadows. This is the excellent spot if you like geometric shapes, lines and the perspectives in your photos. The architecture of this place is magnificent. This is a very romantic bridge so and I think it’s a fantastic place to take pictures! 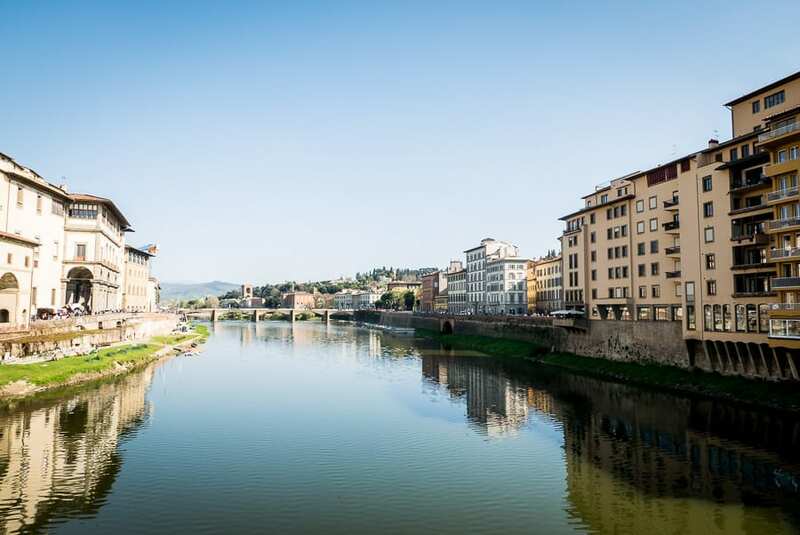 Did you know that in the ancient times Ponte Vecchio housed all the Butcher’s shops of Florence? 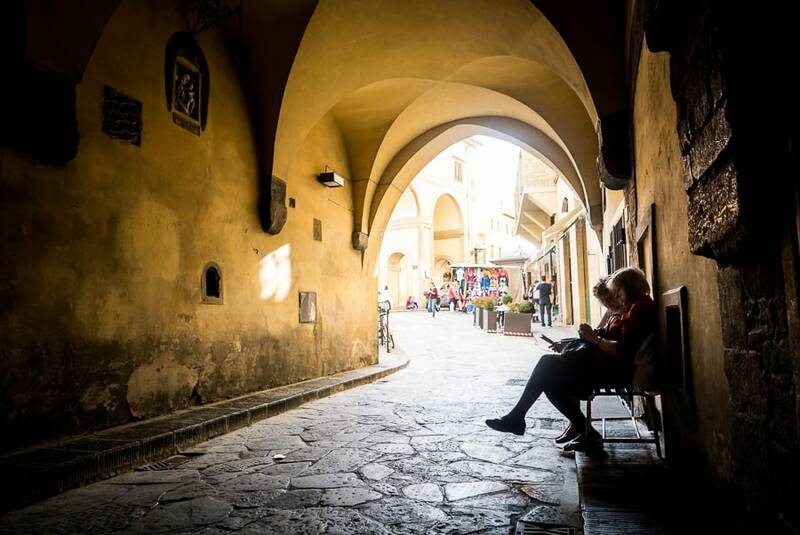 It was only after the 16th century that they were replaced by jewelry shops, as still seen today. 1. The warm light. Yes, especially when the sun shines in the late afternoon, the atmosphere is incredible! 2. The sight. 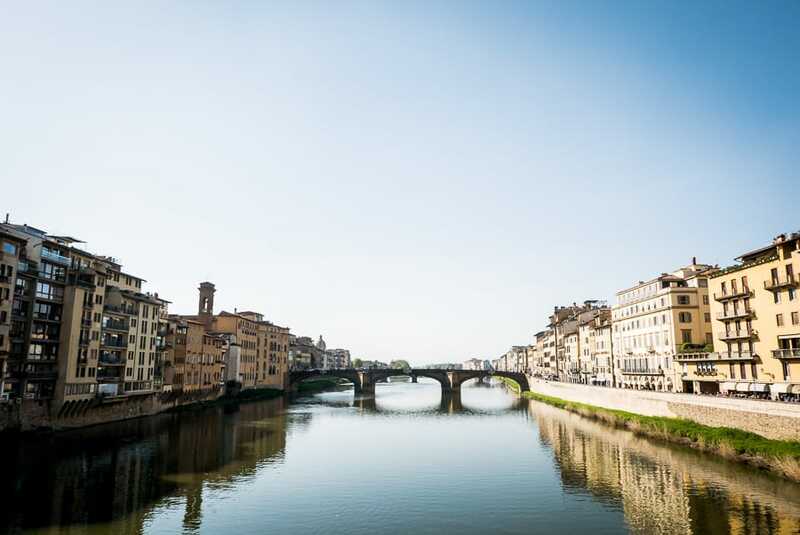 Standing on this bridge you can admire all the sights along the Arno river. 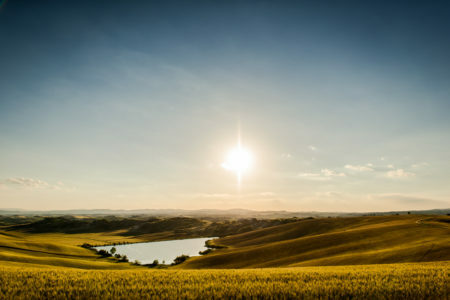 In this spot you can really have a lot of options for locations for your bride and groom and shoot their photos, try to arrive in the late afternoon so you’ll be sure to catch the best light! 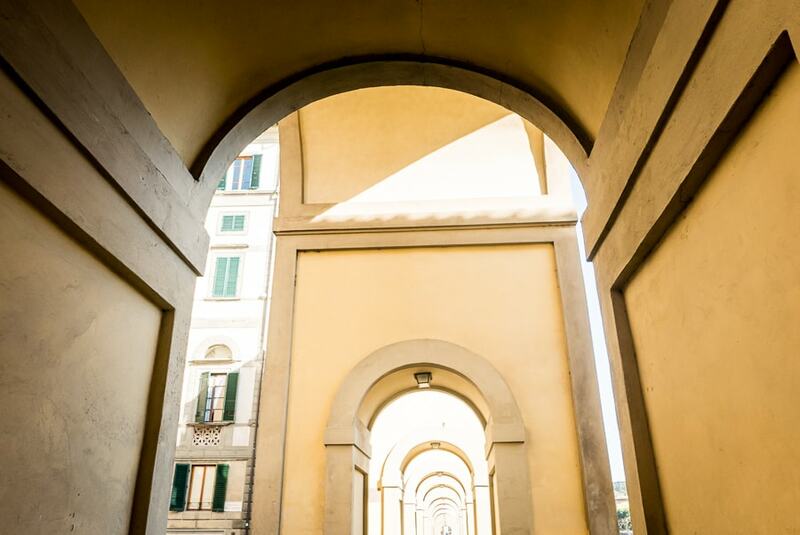 This corridor is a famous elevated passageway, connecting Palazzo Vecchio to Palazzo Pitti, passing over the Ponte Vecchio. 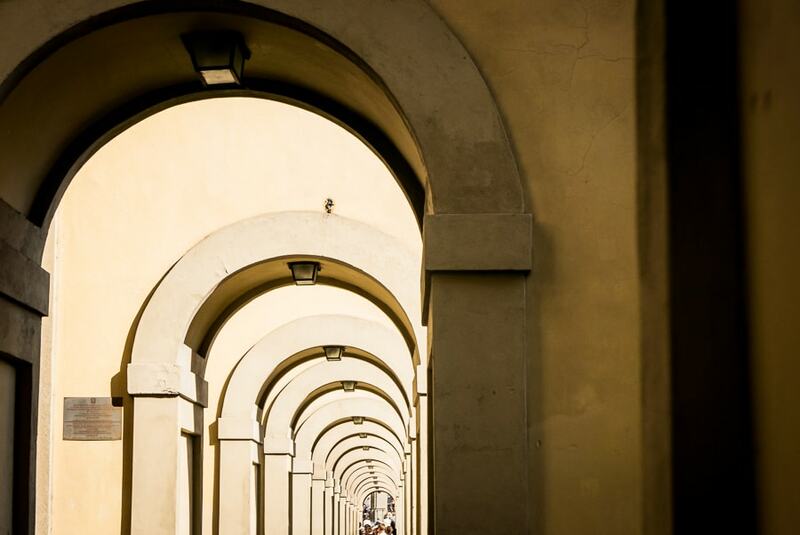 Vasari corridor is not opened for photography shoots inside but it has a wonderful loggiato where you can take some photos with bride and groom! 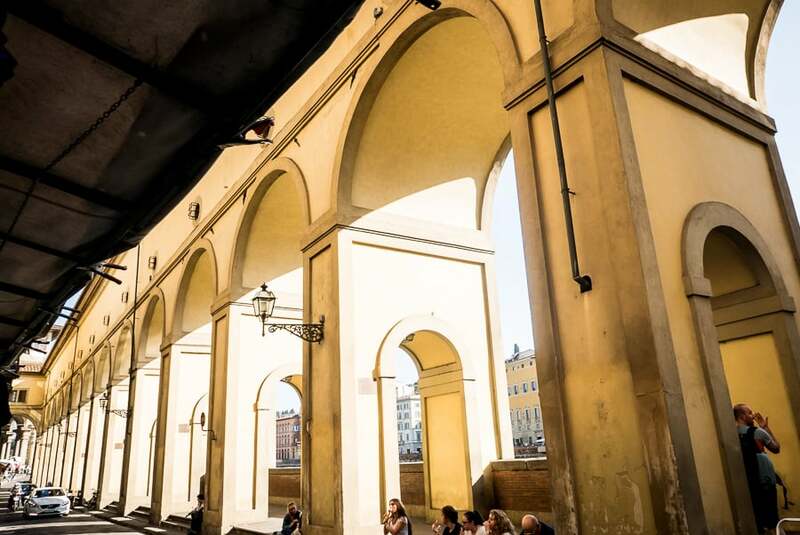 This is one of the most elegant bridges in Florence and it’s just next after Ponte Vecchio. 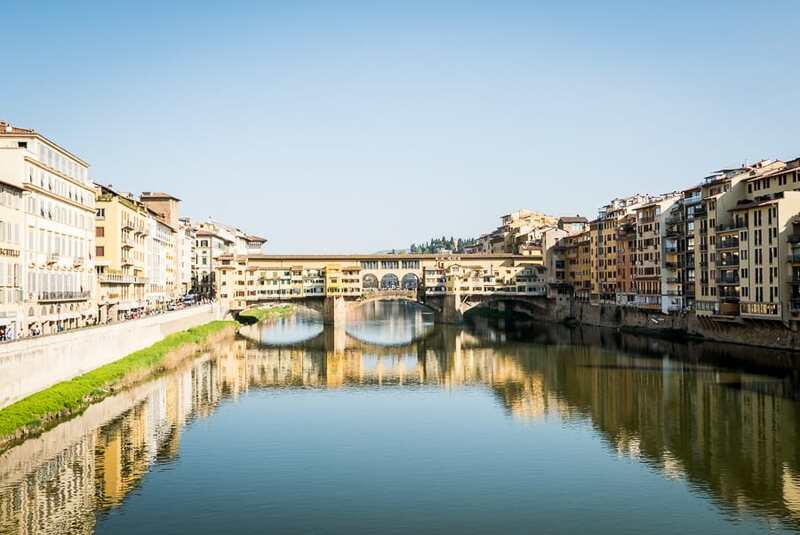 It is a really interesting photographic spot because from here you have one of the most impressive view of Ponte Vecchio, the Arno river and Florence. 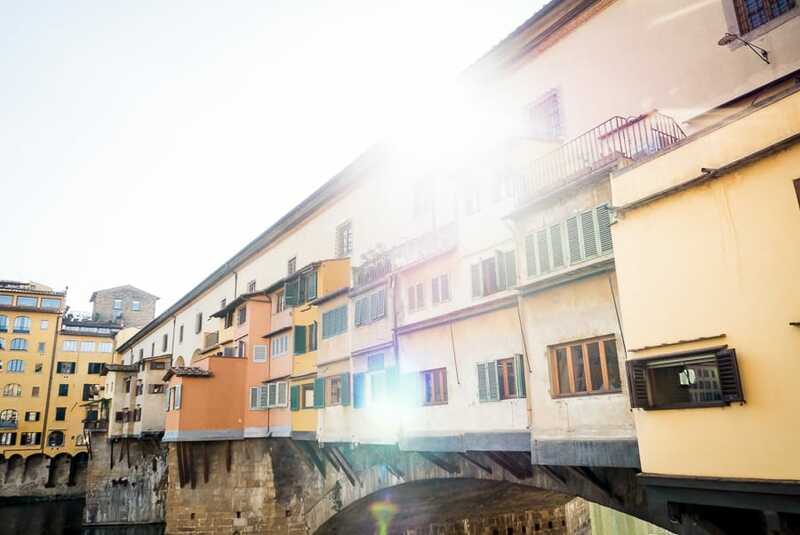 You can reach Ponte Santa Trinità in 3 minutes on foot and once there, the bride and groom can sit down for their photos with the Ponte Vecchio as backdrop. The photo will be like a postcard and they will be happy, for sure! This Church is near the train station, and has a big square in front of it. It has many places where the bride and groom can walk, while you are taking pictures of them. 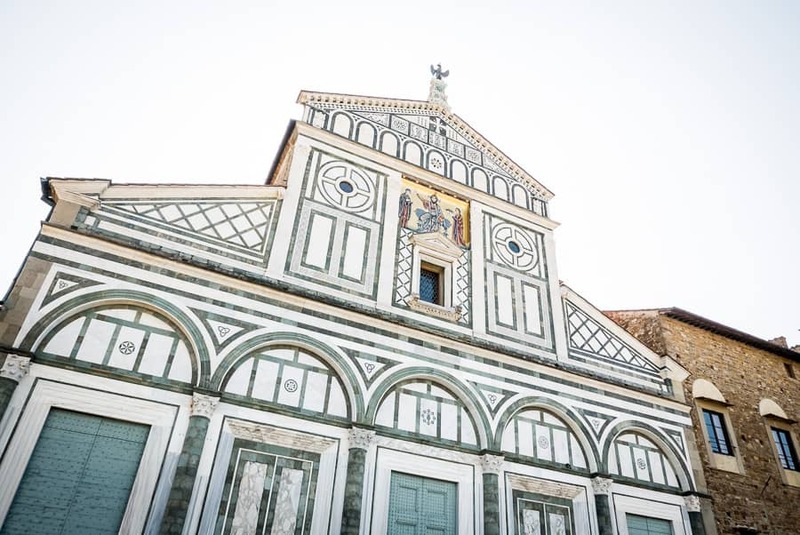 Santa Maria Novella Church also has a beautiful facade with an impressive entrance. Have a look at some photos below. Maybe you will think this is an interesting spot for your wedding couple. 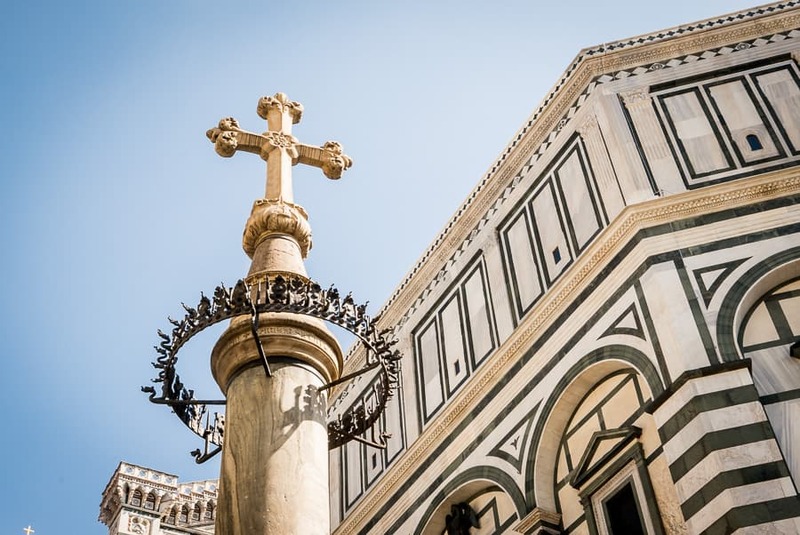 Well, there are many interesting spots, as you can see from this post, to take good wedding photos in Florence, but these are certainly not all of them. 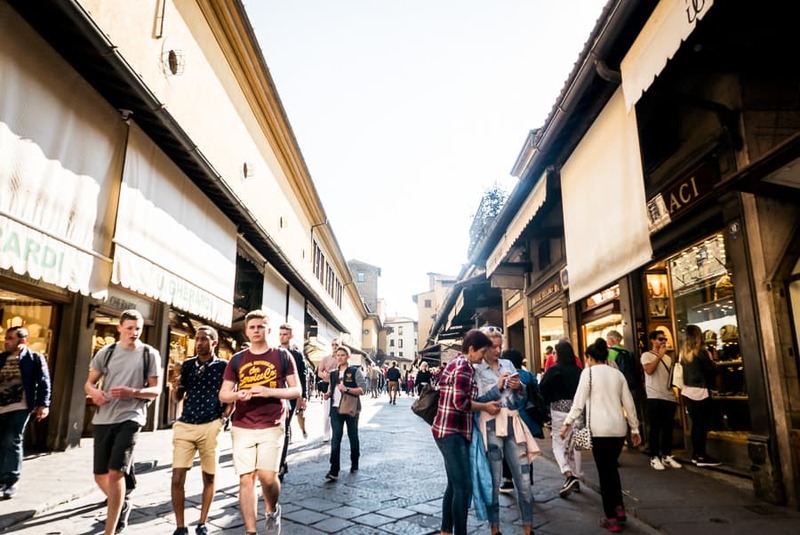 Walking in the centre of Florence, even along some hidden streets, you can find so many corners and little streets with some characteristic shops and many other places that could give you inspiration for your shoot in Florence. This is an unusual location for wedding photos in Florence but I think that this spot is absolutely incredible and original. 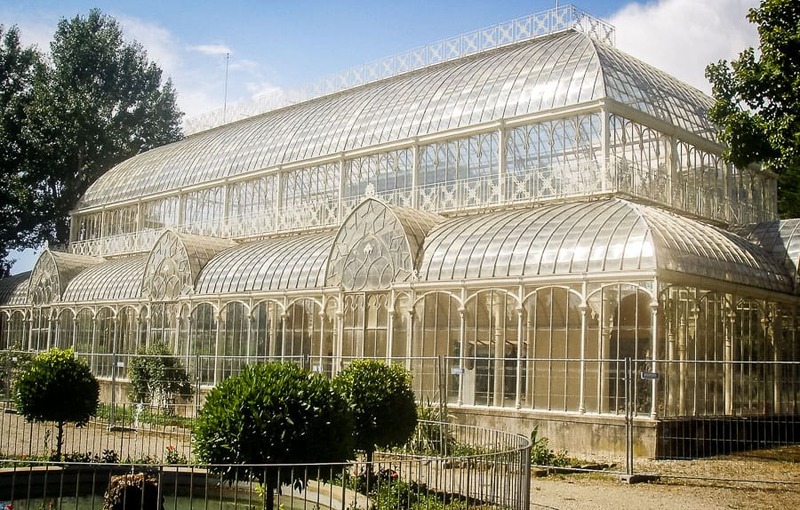 The large greenhouse is a work of art and gives a touch of magic to the atmosphere. The Horticultural Gardens are free entry but it’s usually not possible to go into the greenhouse. In any case, outside is fantastic, too! 14. 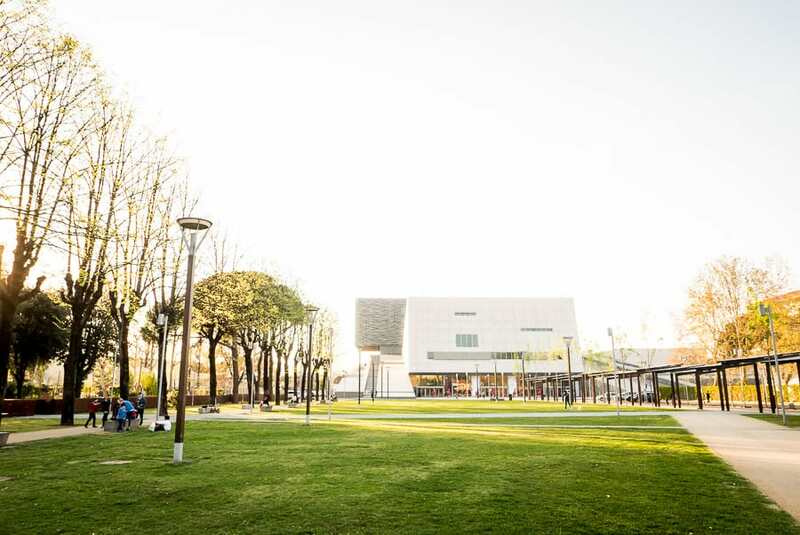 Park of Stibbert Museum. This park is the pretty garden part of the Stibbert Museum. 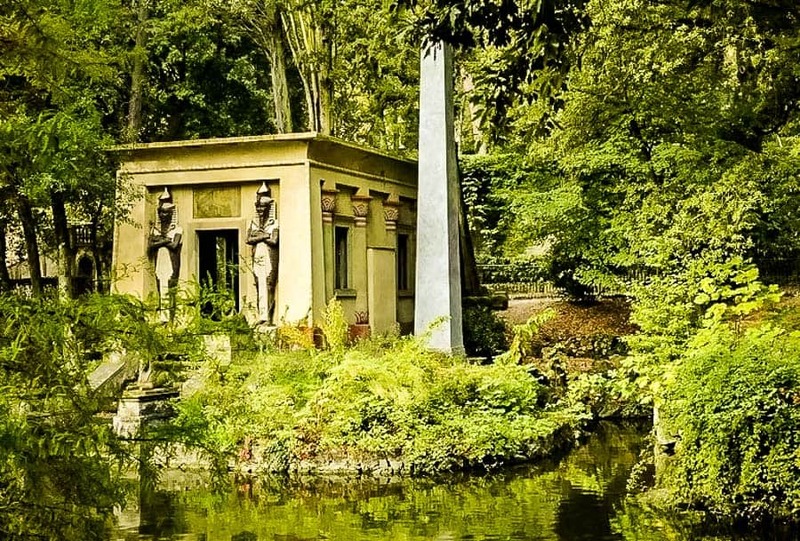 The garden is free entry so you can enjoy here a perfect atmosphere. 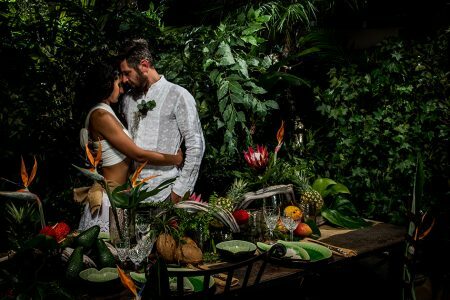 You’ll have the opportunity to take wedding photos in this really amazing spot with a touch of Egyptian mood with a temples and rock caves. This is not a common place to have a shoot but it’s a fantastic location and really calm. It’s just a few steps from the city centre. If you’re looking for a romantic and relaxed photoshoot, this will suite you, for sure! This is a museum garden. It’s a part of Museum of Pitti Palace. 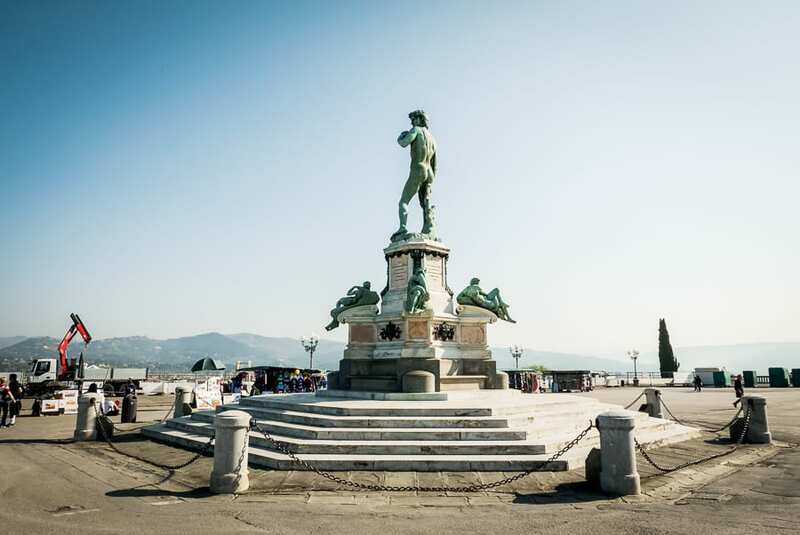 It’s a monumental and ancient garden full of art, statues, fountains an amphitheater and other incredible artistic works. 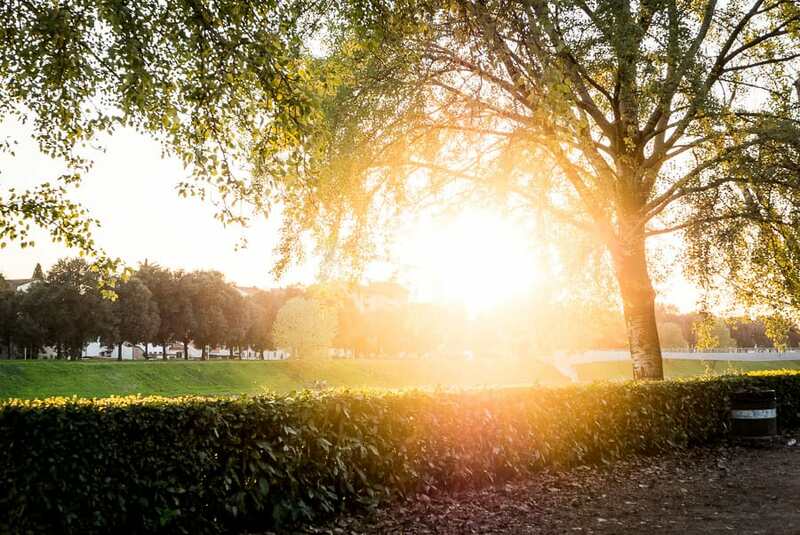 Boboli Garden is a really perfect place for a wedding shooting or even just an engagement session. Look at some photos below to get an idea. If you would like to see all the photos click here! ..ohh..don’t forget – this spot is not free entrance! Yes, exactly! 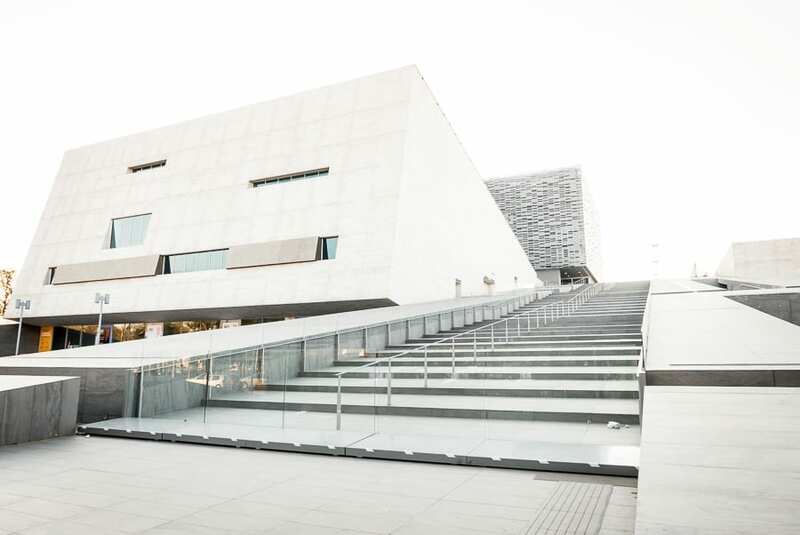 A Theatre, but not a normal theatre, just one of the most modern examples of architecture you can find in Tuscany. 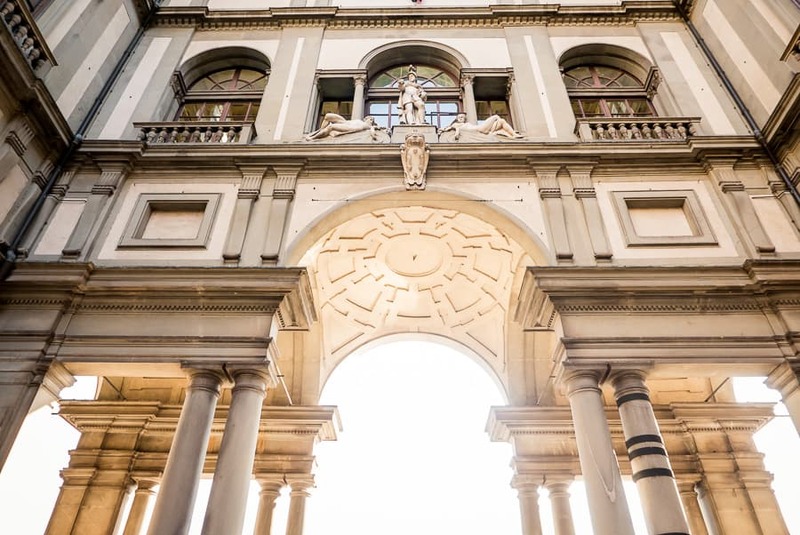 Florence Opera House is a really big squared building with particular geometric forms that gives the area a sense of surrealism. It’s a really particular spot for wedding photography but I think that it’s perfect for taking some original and creative pictures of the bride and groom! 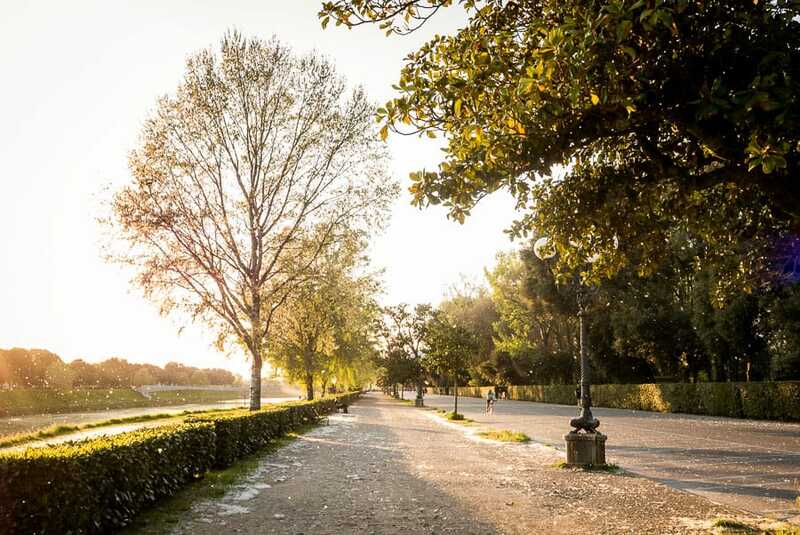 Here we are with the largest park in Florence, next to the Arno River, the green heart of the city. 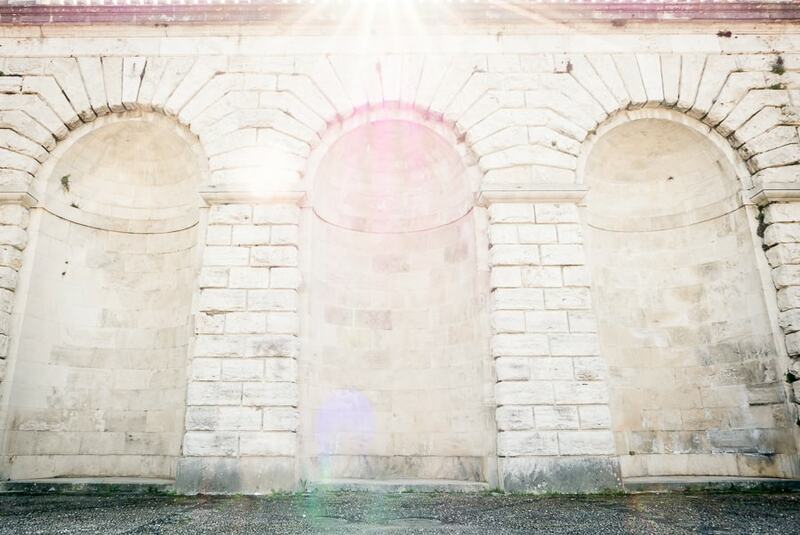 Here you can be relaxed, and have lot of inspiration for your wedding shooting! 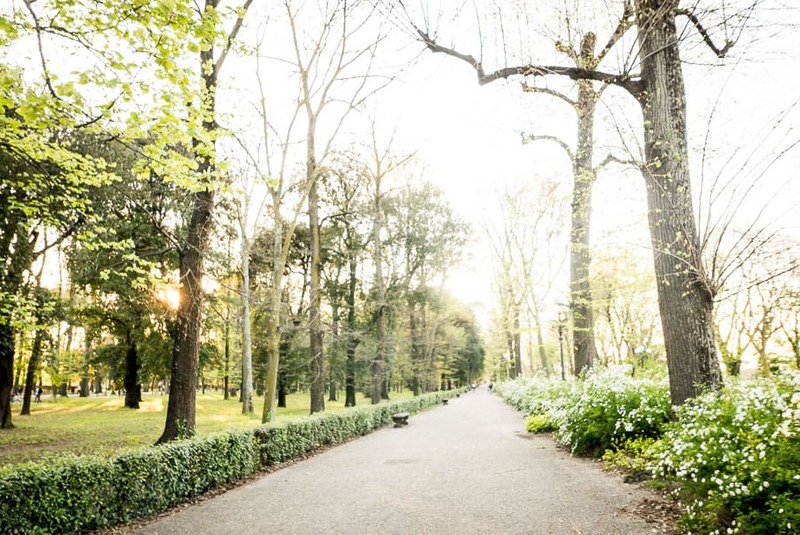 Cascine Park is a really perfect location for a wedding photographer! To simplify things, I’ve created a map to find your way around in Florence where all of the above-mentioned spots are located. 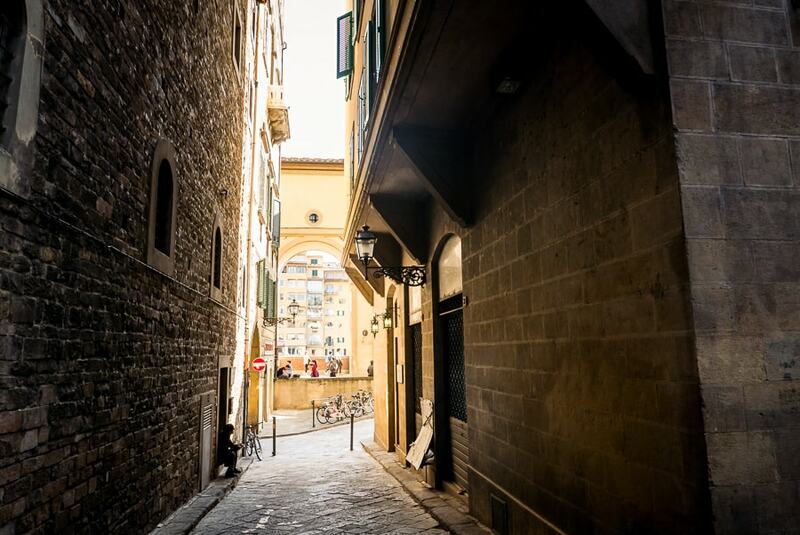 Florence, like other cities in Tuscany, has many interesting locations to take photography, and obviously this post shows you just a few ideas for inspiration. 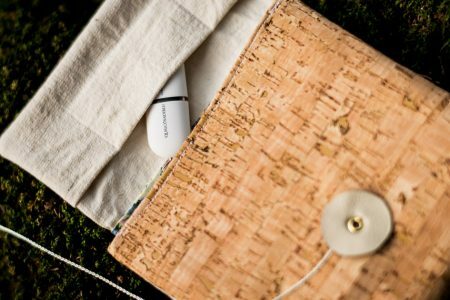 This is considered an open post, so if you have some suggestions or if you took wedding photos in some other interesting points and you want to share them with me, please write them down in the comments and I’ll update the list with your credits! Beautiful Florence and beautiful service, thank you!